The biweekly Zogby poll of 16 battleground states taken Aug 30 to Sept 3 has now been released. It was taken during the RNC and many people were polled before Bush's acceptance speech, so it does not full reflect the post convention bounce (but see below). Neverthless, it is more recent than any other round of battleground state polls. Briefly summarized, it shows that Bush is gaining, but still has a ways to go. He now leads in four states compared to only two states in the Aug. 17-21 poll. In three of these states, West Virginia, Tennessee, and all-important Ohio, his lead is outside the margin of error. In Ohio it is a whopping 11%. On the other hand, Kerry's lead in Michigan, New Mexico, Oregon, and Washington is also outside the margin of error. 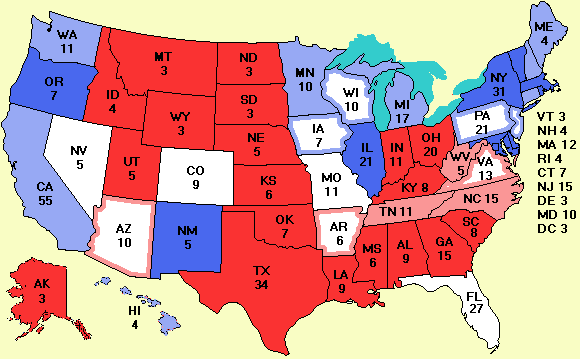 In Florida, Nevada, and Missouri, Kerry leads slightly, but the map shows them as tied because the numbers round to the same integer. I have gotten e-mail from some people who don't trust Zogby, either because he uses a new technology (normalized Internet polling) or because they don't like his results or because he is personally a Democrat. The technology is indeed new, but telephone polling wasn't trusted when it first came out (sometimes with justification as in the 1936 Literary Digest poll), but it eventually became the norm. Like all pollsters, Zogby normalizes his results to make sure he has correctly weighted for first-time male voters, single white women 25-35, African-American grandmothers, etc. It was for precisely this failure to correct the raw data that Rasmussen chastised Time and Newsweek Monday. In 2000, Zogby was the most accurate pollster and the only one to predict Gore would win the popular vote. But the thing that makes me most confident of Zogby is that he is the Wall St Journal's house pollster. The WSJ is not some wacko leftist organization whose goal is to make Kerry look good. They are paying good money for Zogby's services (traditional polls cost around $15,000 per state but obviously the WSJ buys so many polls that they get a very large discount) and are staking their reputation as a newspaper on his results. To me, having a conservative Republican newspaper like the WSJ choose Zogby over all his competitors speaks volumes about his accuracy and professionalism. In the 3-day rolling average poll, Rasmussen now has Kerry and Bush exactly tied at 47.3% each nationally, with Kerry 1.2% ahead in the battleground states. If we compare this to the 3-day rolling average poll published Aug. 30, Bush is at exactly the same level he was then and Kerry is 0.9% higher. From these data, it appears that the postconvention bounce is already played out. In short, all the hand-wringing and cheering based on the Time and Newsweek polls was a bit premature. If you are a Democrat, you can stop crying in your beer; if you are a Republican, carefully try to pour the champagne back into the bottle. It is still very close. Clarification: Yesterday I said no Republican has ever been elected to the Senate from Louisiana. What I should have said is that no Republican has ever been elected to the Senate by the people of Louisiana. During reconstruction, when the governments of the southern states were in turmoil and carpetbaggers swarmed over the land, three Republicans, John Harris, Joseph West, and William Kellogg, were appointed by the state legislature. However, no Republican has ever been elected to the Senate from Louisiana since direct election of senators began after the XVIIth amendment was ratified in 1913. My apologies for the confusion caused to students of Louisiana history.